I love the versatility of smaller lengths of leftover knitting wool, so I wanted to create a list of fabulous knitting patterns for yarn scraps and mini skeins. This post was inspired by the ADVENTurous Wrap KAL currently going on that my friends are participating in. I’ll write all about it when I’m back in a couple weeks, but first, here are some patterns so you’re ready for some holiday knitting. I focused the list on accessories, some of which include a main skein as a neutral to ground the pattern, but many could be done entirely in scraps. 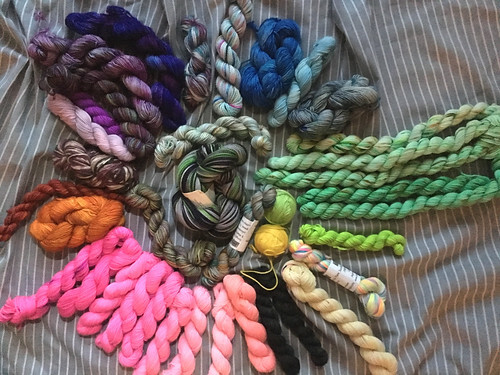 If you want a few new sock mini skeins to mix into your existing leftovers, I listed some fun ones in my December Knitmas post. Or you could imitate the Holiday Yarn ladies, from my forthcoming ADVENTurous Wrap post, and do a small group mini skein swap in which you each buy a certain number of full skeins then one member breaks those down into equal mini skeins. What have you knit lately with mini skeins? Do you have leftovers you don’t know what to do with – or have you found some fun destashing patterns, like Marseille did with the mini granny squares or Leftie? Do tell! This entry was posted in Knitting | Crochet, Tutorials | Patterns and tagged free knitting pattern, free knitting patterns, mini skeins.